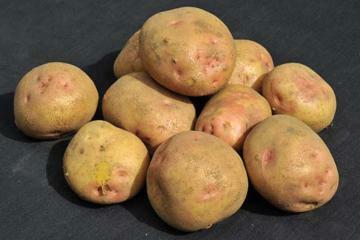 Late Main Crop potato producing tubers with pale yellowish skin, pink eyes and creamy white, soft, moist waxy textured flesh. Strong bushy growth habit and crops well in most situations. Very good disease resistance and drought tolerant. Culinary vegetable. Good for boiling, baking or frying. Reliable variety for allotments, giving good crops whatever the seasonal conditions. An excellent all-rounder.